Cape San Blas Redfish and Trout for Ron and Eric! 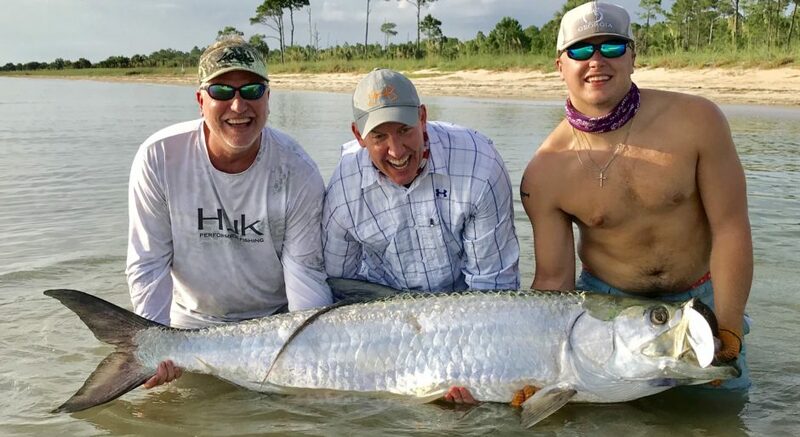 There’s a reason Ron and Eric come to Cape San Blas to fish with me 6-8 times a year – Big Fish!! Posted in Fishing Charter Pictures	| Comments Off on Cape San Blas Redfish and Trout for Ron and Eric! Tallahassee Family And Their Big Trout!!! Very nice family from Tallahassee put it on the stud trout today with 5 over 20”s, biggest went to Linda with a 27.5!!! Posted in Fishing Charter Pictures	| Comments Off on Tallahassee Family And Their Big Trout!!! Big Jacks and Trout Day! Heck of a mixed bag today! Posted in Fishing Charter Pictures, Fishing Charter Recent Posts	| Comments Off on Big Jacks and Trout Day! Andy got jacked by a huge crevalle and Rachael did work on the redfish!! Posted in Fishing Charter Pictures	| Comments Off on All Jacked Up!! Been sight fishing some very nice redfish and pompano from the tower! Posted in Fishing Charter Pictures, Fishing Charter Recent Posts	| Comments Off on Reds and Pompano! Camping and Fishing on Cape San Blas! This awesome couple from Alabama is camping on Cape San Blas this week and decided to pull on some redfish and trout!! Great day!! Posted in Fishing Charter Pictures, Fishing Charter Recent Posts	| Comments Off on Camping and Fishing on Cape San Blas! Brian And Ryan Were Back With A Bang! Dad and son were back this year to put some heat on the redfish and trout! Posted in Fishing Charter Pictures, Fishing Charter Recent Posts	| Comments Off on Brian And Ryan Were Back With A Bang! Great Family Day for the Morris’s! Paw Paw (grandpa), son and the two grand kids had a great time with the flounder, redfish and speckled trout today! Posted in Fishing Charter Pictures	| Comments Off on Great Family Day for the Morris’s! The Redfish And Flounder Action Is Hot! LJ and I got on some big redfish, quality flounder and nice trout this morning!! Posted in Fishing Charter Pictures	| Comments Off on The Redfish And Flounder Action Is Hot! Some Fun Moments From The Past Few Days! Posted in Fishing Charter Pictures	| Comments Off on Some Fun Moments From The Past Few Days!